Naturally, you can spread bet in specific shares – thousands of individual shares are quoted and you can spread bet on any one of them rising or falling. When people talk about financial trading, one of the first things that comes to mind is trading stocks and shares. Using spread betting to trade on the fluctuations of an individual company’s share price is, for reasons mentioned previously, much more effective than merely becoming a shareholder. One of the advantages of spread betting on shares is that there is a great deal of information available on each individual company if you are prepared to do the work. If you are spread betting on an index, then all that information is lumped together, producing an averaging effect. A great advantage of financial spread betting is the ease with which traders in the United Kingdom can speculate on UK, European, American and to a certain extent even Asian shares. Most UK spread betting companies now offer all the FTSE constituents (FTSE 100, FTSE 250 shares) Dow stocks, the S&P500 shares and all main European and NASDAQ stocks as well. Some companies even quote small caps and AIM stocks! Not that I would recommend beginners to start dealing in penny share amateurs… Only consider trading penny shares after you have mastered main market trading and have an understanding of company accounts. Trading share spreadbets on international shares and sectors is particularly advantageous since it allows traders access to bigger and more liquid markets that offer more trading opportunities than what is available locally. Shares can be traded only when the underlying exchange for that particular country is open. The UK and European markets are open from 08:30 until 16:30, while the US market can be traded from 14:30 until 21:00. 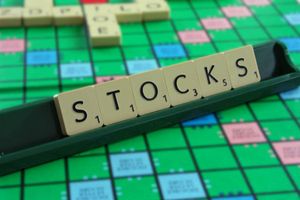 While as a beginner you may be safer placing spread bets on UK shares, your broker will usually allow you to bet on shares of other countries, particularly the US markets. The United States stock markets tend to be more volatile, perhaps because of the high volume of trades, so are best avoided while you are learning to spread bet, but can be more rewarding when you can handle them. Interestingly data from some spread betting providers shows that shares tend to attract spread traders who have longer-term views. In fact a random sample in August revealed that longer-term spreadbets accounted for 21.9 per cent of trades in gold, and 19.2 per cent of trades on Barclays shares made at IG Index. Capital Spreads has also witnessed a similar trend in individual shares dealing. Spread betting on shares is straightforward, and you will be quoted a buy and a sell price by your spread betting provider. You can then decide to buy (go long anticipating a rise in price), or to sell (go short). There seems to be a natural aversion to going short on the stock market, and this is a pity. If the situation warrants it, going short is likely to be a trade that makes money more quickly. Bets on BP, Tesco and Vodafone are very popular. Mining and banking stocks are two sectors that also tend to attract a lot of interest from spreadbetters and stocks like Barclays, Lloyds, Royal Bank of Scotland, BHP Billiton (BLT) and Rio Tinto tend to be very popular spread betting markets. You think company ABC is about to buy company XYZ. You feel that this will result in a rise in share price for company ABC so you decide you are going to place a trade. You will buy (go long) in this instance. 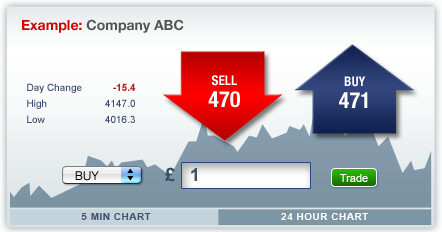 The spread betting provider’s price of company ABC is 470p – 471p. You decide to open a buy (go long) bet on our daily rolling cash bet of £1 per point of ABC at the higher price of 471. This equates to owning 100 shares of company ABC, actual shares at a price of 471p. The value of the shares is calculated by multiplying the stake (in this case £1) by the price you have paid, so in this example the value of the bet would be £471. The result is also known as the total trade consideration. As financial spread betting is traded on margin, a small percentage of the total trade consideration is required to secure the trade, in this example the margin requirement is 10%, and therefore you need only £47.10 in your account with us to open the bet (£471.10 x 10%). Please remember sometimes the markets move adversely therefore the provider may require further funds from you to cover your open losses. The price doesn’t really fluctuate over the next 4 days so you decide to keep your position open allowing the trade to rollover. On the 5th day the takeover goes through, resulting in a rise in company ABC’s share price to 582p – 583p. The provider’s selling price is now showing 582 against your initial purchase of company ABC at 471, the position equates to a rise of 111 pence. You therefore decide to close the bet by selling an amount equal to your initial opening bet, so in this case £1. If the market price had fallen and you decided to sell you would have incurred a loss. Smaller companies generally have bigger spreads on them. A large spread directly corresponds with a share in which there is a low level of turnover. There are numerous reasons which would explain low turnover, of which “tightly held” (i.e. a large fraction of shares are held in the long term by investors who are not active) is one, but remember there are other possible reasons for low turnover. In addition, volatile shares usually reflect the underlying uncertainty in their earnings prospects. Since volatility or standard deviation is usually used as a measure of ‘risk’ this should affect your position sizing. So for example, you will want to diversify the number of holdings you have in a risky sector like, say, biotech. If you watch the markets, you will see that share prices tend to drop faster than they rise. When share prices go up, it requires traders and institutions actually spending money to create the demand. When prices drop, it is easy to sell the shares and take the money without any preparatory work. Falling prices tend to cause a certain panic, and this will chase the price down. Therefore, provided your analysis is telling you that the time is right for the price to fall rather than rise, you will make profits more easily trading short. Spread betting providers quote rolling daily price as well as a price for some of the shares for two dates up to six months ahead. You can usually select either date (or both, of course). The minimum bet on UK shares is usually a pound for each penny move, which is equivalent to an investment in 100 shares. Likewise, margins differ markedly from provider to provider although as a general rule margins are higher the more volatile and illiquid a share. The spread is variable and subject to market conditions. It also depends upon the price of the share and whether or not the bet is Controlled Risk (i.e. linked with a guaranteed stop loss level). If you would like to trade short-term, then a daily rolling bet might be appropriate as these have tighter spreads than the futures. Daily bets can be rolled overnight so as to retain the trade open, although this incurs an overnight interest charge. For longer term trades it might work out cheaper to utilise the quarterly share price futures. These are likely to have spreads of 4 points or over as futures include the cost of financing. The ‘near month’ is the closest in time price you will be quoted. The ‘far’ month is the more distant of the two futures quoted. This is normally current quarter, and next quarter. The quarters vary from share to share – the further away the expiry date of the future, the wider the spread premium to reflect the ‘fair value’ which will then gradually erode over the remaining time to expiry. page on IG Index’s Insight Centre in this instance comes in useful as it has a list of important upcoming dates, to help you plan your positions. Here it is also important to specialise in just a few companies. Its far easier to follow 10-15 companies and get to know them really well than all the stocks in the FTSE 250 for instance. Its easy to update them daily without emotion and its definitely likely to be more profitable. If you overstretch yourself by following too many stocks, the results would likely be more random, so the greater number of stocks you select from the more random your results would be. Eventually you’d be throwing a dart at the dartboard. It’s possible to research the prospects of a company in great detail, and although unexpected external events can clearly have an effect they can (to some degree) be taken into account when making an investment. An index or a currency is a very nebulous beast that is hugely influenced by any number of external factors and is impossible to research to the same level of confidence. All one can do is develop a “feeling” about which way the price will go in the medium to long term. Indices and currencies are quoted to much higher precision. This fine granularity exposes lots of volatility, leading to exciting, short-term gambling opportunities. Punters can lose lots of money this way. It is July. The current price of BT is 221. You decide that the price is going to drop due to increased competition and bulk discounts on telecomms services. You call and get a price for the current quarter (ends in August) and the next quarter (end in November). They quote 240/246 and 248/255 for the two quarters. It seems that most sentiment is bullish, and you are on your own. Great! It’s good to be contrary. You go for the current quarter and sell August British Telecom at £50/point. You deal at 240. The deposit factor is 25, and so you must cover your bet to the tune of 25 x £50 = £1250. The deposit factor for individual blue chip shares is about 5% of the quoted share price. Your are wrong, everyone else is right. BT shares rise steadily, passing 240. You call for a new August price and are given 265/271. You decide to get out and so you BUY BT at £50 a point, doing the trade at 271. It is January. The current price of BP is 611. You call for a March price. The other period you could have chosen is the next quarter, ending in June. They quote you 620/628. Your decide that BP shares are going to rise significantly. Market sentiment seems to agree. You BUY March BP, £20/point at 628. Your deposit required is 30 x £20 = £600. Your guess is correct. BP shares take off and make substantial gains. During February, you decide to take profits and call for the latest price. You are quoted 650/670. You give them instructions to: ‘Sell March BP at £20 a point’. This closes your bet. You deal at 650, the lower of the two prices.